It’s quite simple but it’s the law of life that has governed majority of my adulthood dilemma. The push and pull of giving in to indulgence and paying for it; or sacrificing a little and basking in the rewards. That’s what I believed in anyway. 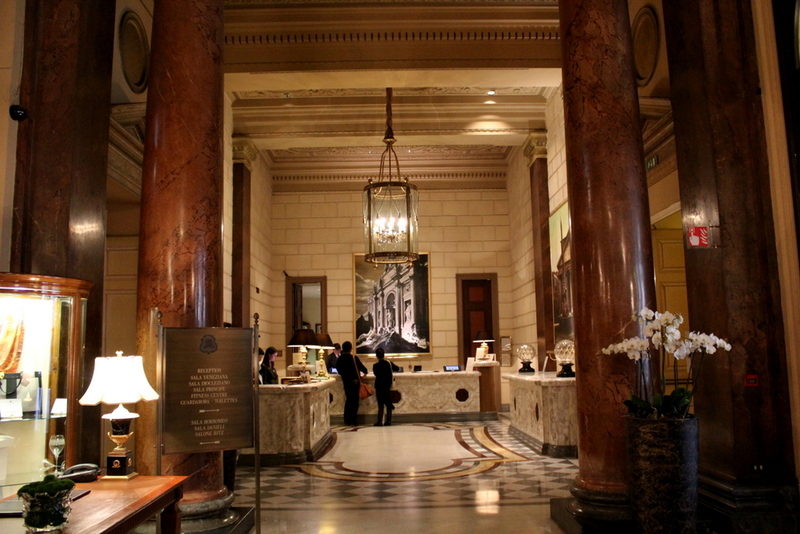 Until I went to Rome stayed at The St. Regis Hotel, where I found that I can have my cake and eat it too. 120 years later, now managed by Starwood Hotels, St Regis Rome still bears the famous name of “Le Grand Hotel”, and hasn’t lost one bit of it’s Belle Epoque atmosphere. 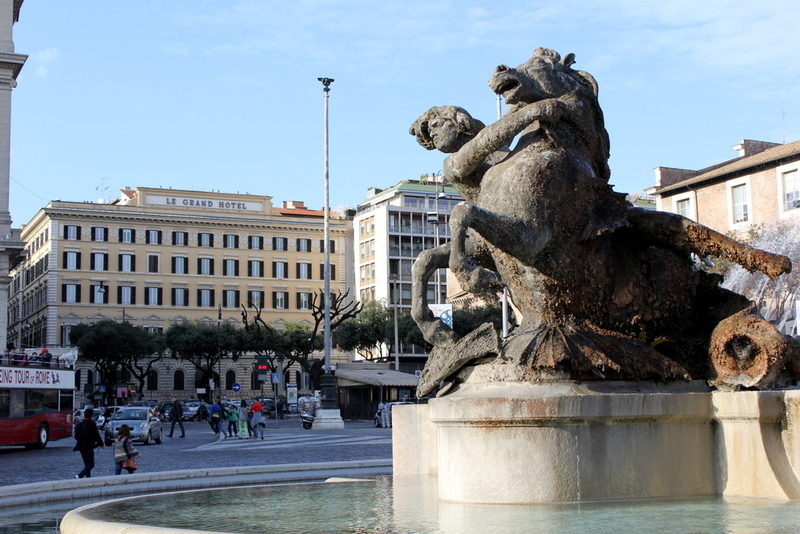 A few steps from Piazza Della Rupublica and a short walk from Via Veneto. 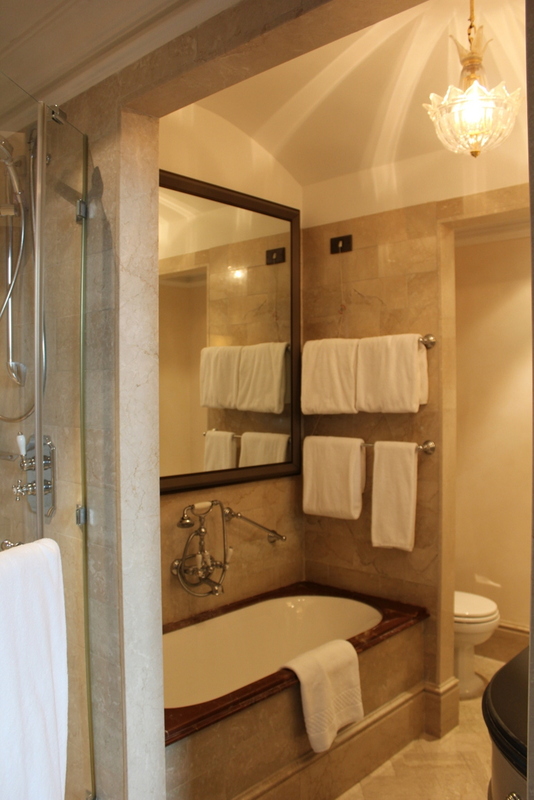 The Spanish Steps and the Trevi Fountain are also just 15 minutes away. St Regis Rome is in the historical and cultural hub of Rome. As our cab approached the gates of the hotel, I resisted the urge to spring the cab doors open while the vehicle was still moving, and step into the inviting world of St Regis Rome. The smiling doorman of St Regis made that happen as he ushered us in and helped us with our bags. Tall columns, high ceilings, white marbled floor, a glass cage chandelier– it’s what I imagined the Great Gatsby’s mansion would be like. 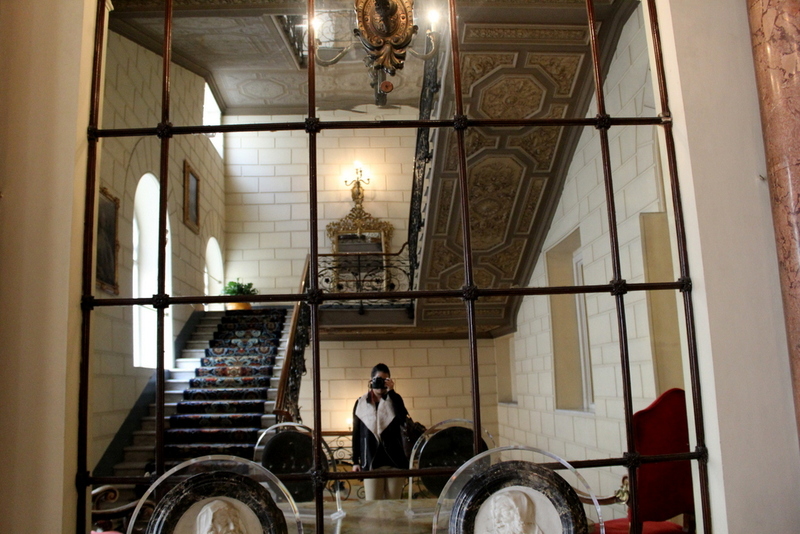 But instead of a frosty and melancholy reception (as the lonely Gatsby mansion is known for), warm greetings of “Buongiorno!” resonated throughout. All staff were very cordial, very warm and friendly. We’re off to a good start! Our room was a Couture Studio. 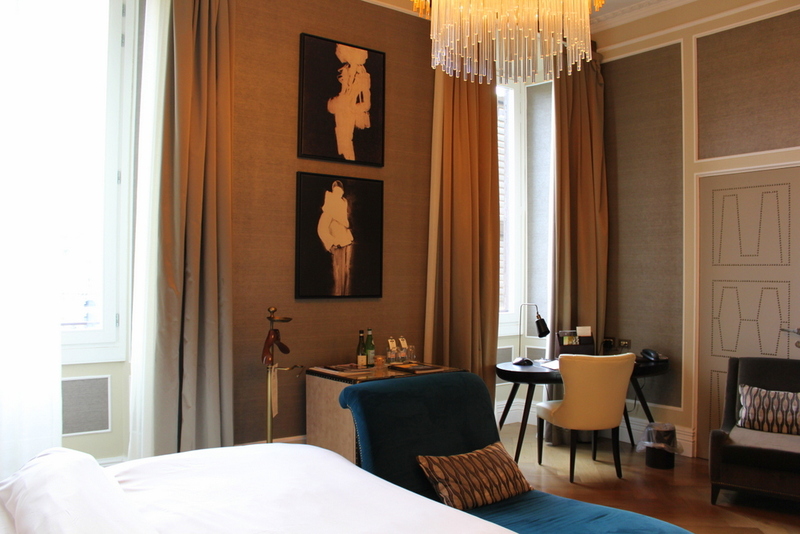 The rooms of St Regis Rome all have names based on the paintings in the room (and the style). The Couture Studio was designed and conceptualised behind Italian couture and fashion. 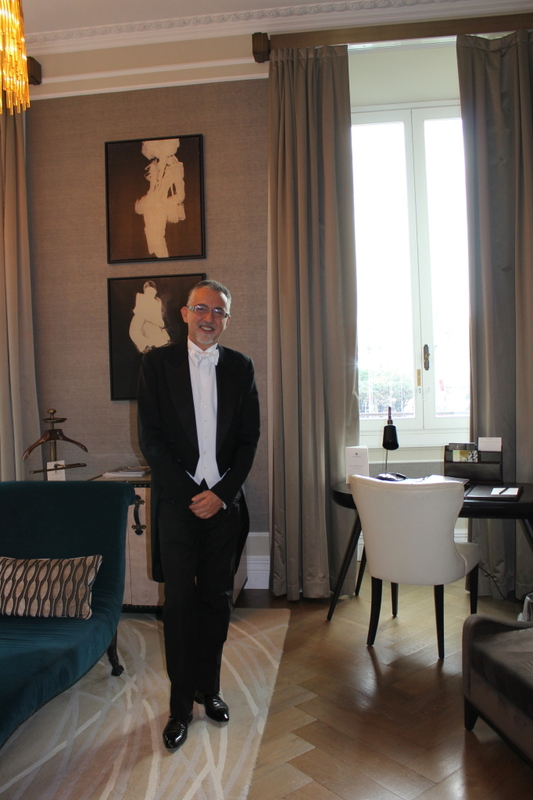 I love the colour scheme of the room – light greys and neutrals with an accent of teal. The high ceiling and grand chandelier gave it a very spacious feel. 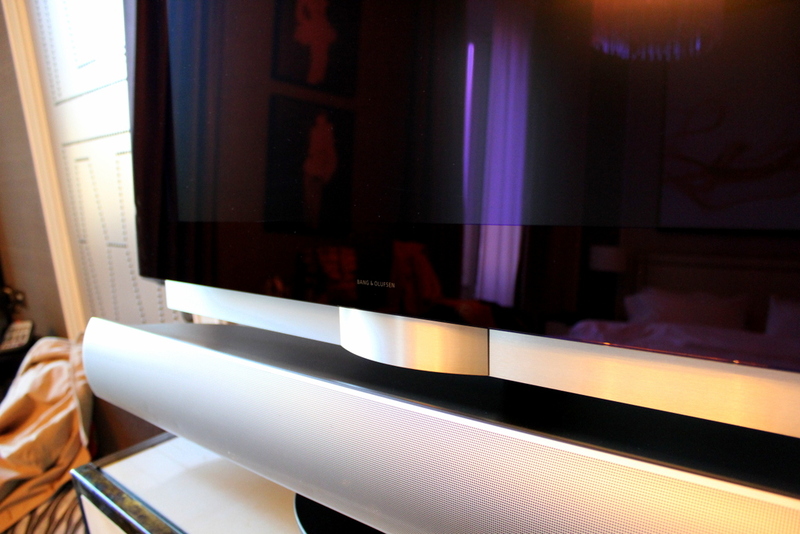 I don’t normally take note of televisions or anything ‘techy’ in the room but the television in the room, by Bang and Olufsen, is one nifty machine! It has a built in CD player (ok, that’s not out of this world), but the TV automatically swivels back to its original position when you switch it off (after adjusting it say, towards the angle of the bed for late night watching). 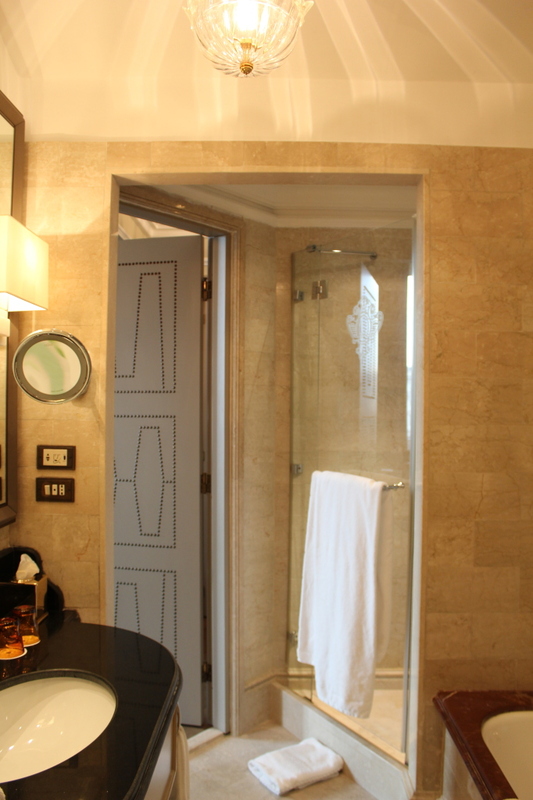 The bathroom, while not so big in size, had a separate bath, shower and toilet area. 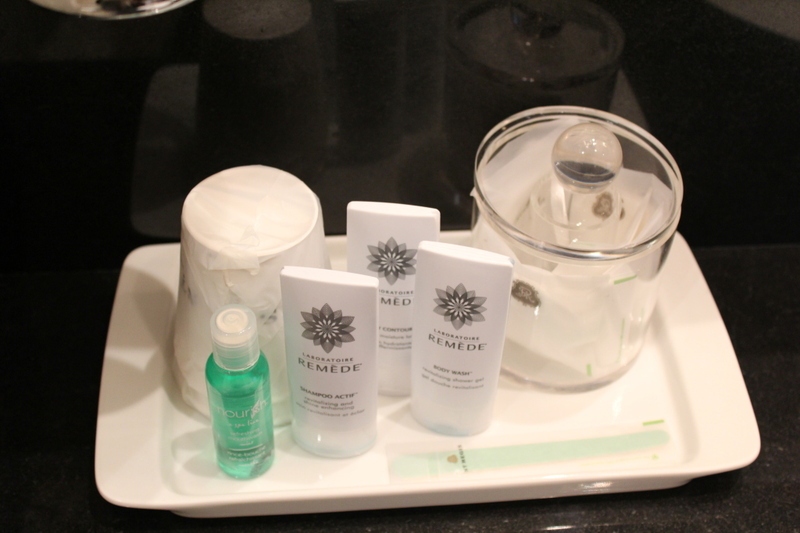 Toiletries are from Remede , a signature brand from all St Regis properties. Refills are generous, and though I liked the body scrub/wash, the body lotion was quite runny. 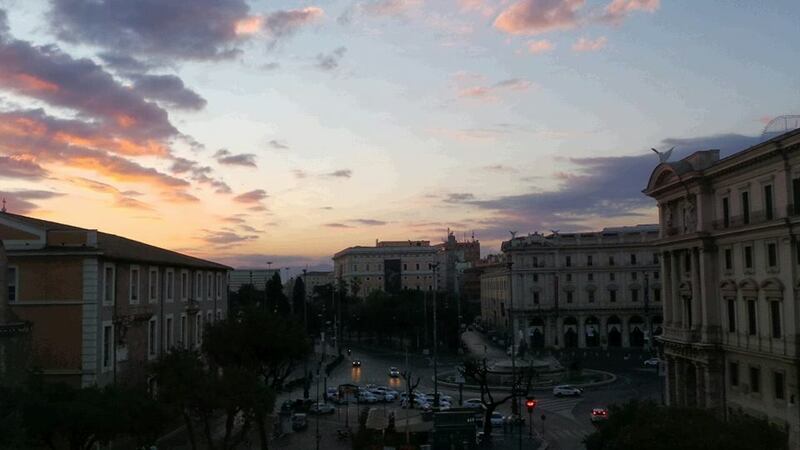 The room overlooks the Piazza Della Republica, and this was one of the views at 6AM one morning. My personal favourite among all the designer suite series, as it features a contemporary furnishing in muted tones, and selected accessories that showcase the signature Bottega Veneta leather weaving. 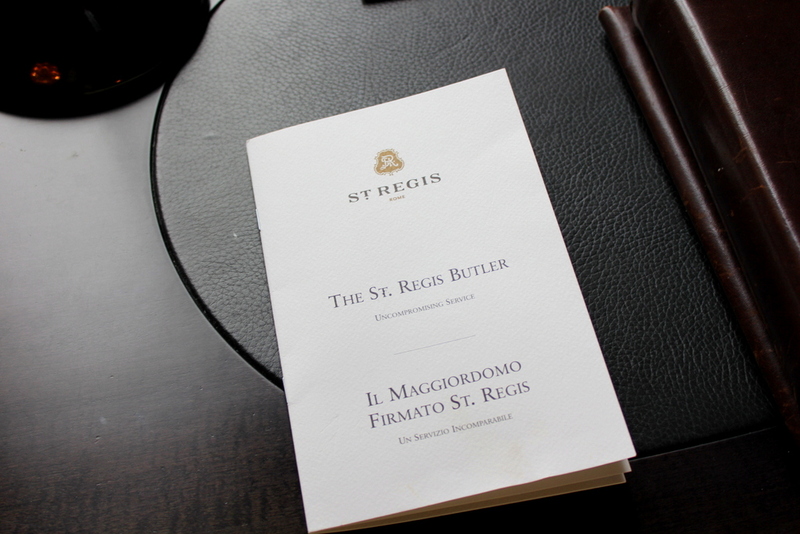 St. Regis (worldwide) proudly offers a dedicated butler service, and I was leafing through this very comprehensive room booklet and guide to the butler service when a I heard a knock at the door. A gallant, soft-spoken gentleman introduced himself. Giovanni, our St. Regis butler. He asked if he could be of assistance to anything at all (we didn’t need anything done except recommendations for lunch! ), and even offered to unpack our luggage (very kind offer, but it wasn’t necessary). He reminded me that anytime we need anything to contact him directly. The butler service has been St Regis’ legendary trademark for over 100 years. 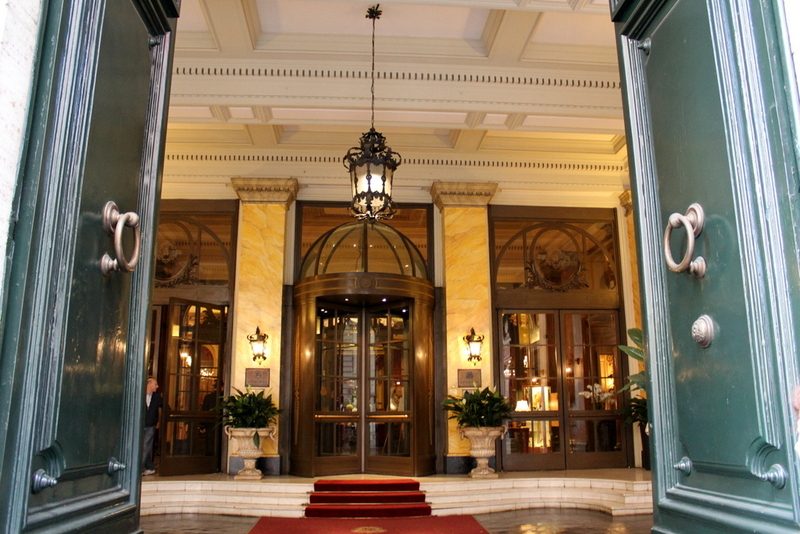 since the very first guests were welcomed in 1904, at St Regis in New York. Make your own Bloody Mary – welcome to St Regis Rome! 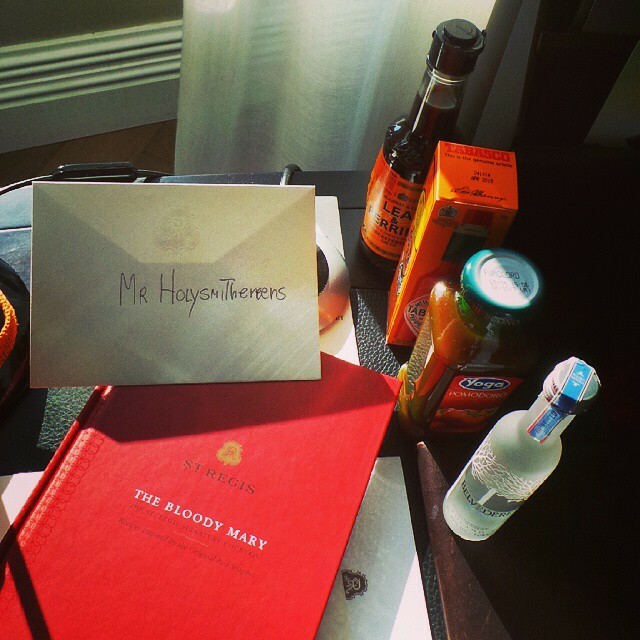 In celebration of the Bloody Mary anniversary (which was concocted in 1934 at the King Cole Bar in St Regis New York), St. Regis Rome has given me my very own Make-Your-Own Bloody Mary kit! I first learned how to make Bloody Mary in 2004 when I briefly worked as a cabin crew, and now, 10 years later I gamely tried my hand at it again! They also gave me a hardbound book that contained all signature Bloody Mary recipes from all St.Regis properties worldwide. Combine all of the ingredients, except the celery stalk, in a shaker and shake well. Pour into an 8 oz / .2 l white wineglass filled with ice. Garnish with the celery stalk. Christmas came early for me! 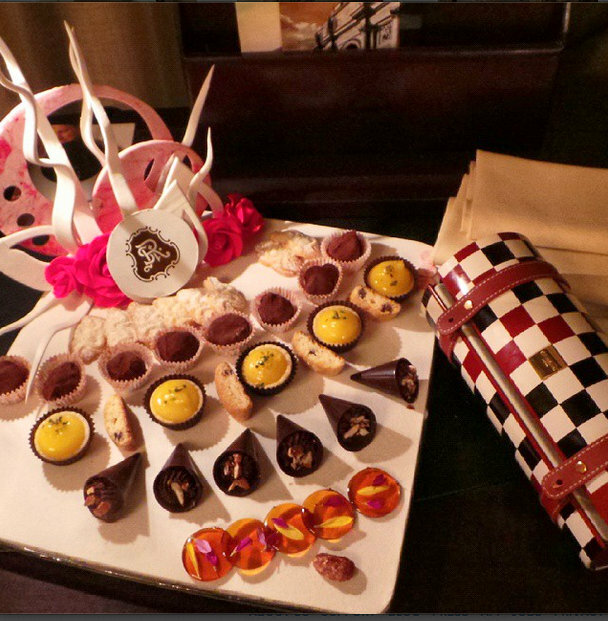 The biggest chocolate platter and a selection of tea (encased in the black and white clutch). And it was at this moment , that I was drunk in both Bloody Mary AND chocolates, that I realised that St Regis Rome had defied the old Italian proverb of “Eat little…Sleep Sound” because I had my very best sleep that night. The bed was extremely comfortable and the pillows plump and firm. Yes, at St Regis Rome, I ate big and slept extremely soundly! Breakfasts are a grand affair at St Regis Rome. My constant breakfast is always yogurt and muesli, yet I felt like attending a ball every 8AM for breakfast at the Grand Lobby. There’s a wide selection of breads, fruit, cheese and cereal, as well as hot items. They also have an omelette / egg station, manned by the most charming cook. 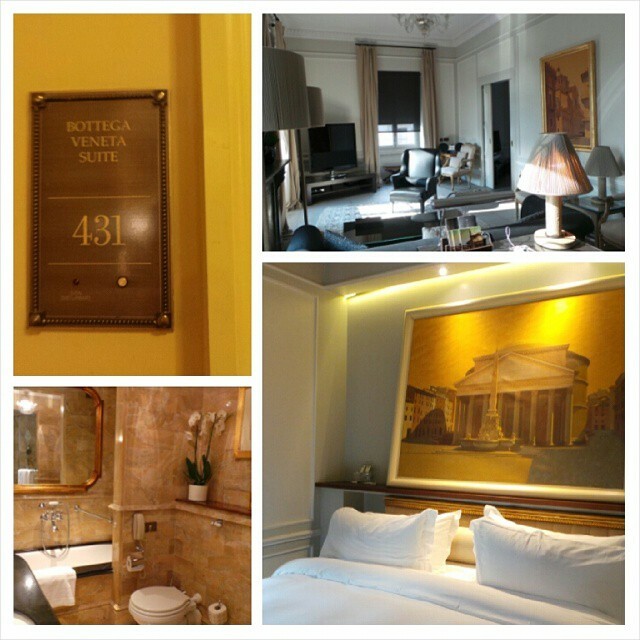 Hands down, I absolutely enjoyed the customer service by St. Regis Rome. 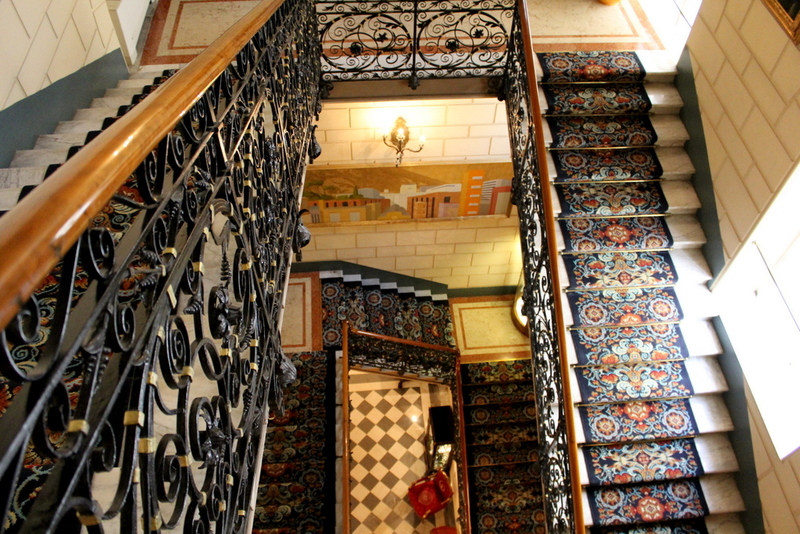 From the warm reception at check-in, to our butler Giovanni, to the wonderful omelette man at breakfast.With such grand and formal surroundings, the staff’s warm and friendly approach to guests definitely complemented the experience. Wonderful work by the customer service training , or they just hired all the right people for the job as service was consistent on all levels of staff– everyone had a ready smile and addressed me by name. They say that when in Rome, do as the Romans do. If I may be so bold to suggest that when you are in Rome, live like a Roman Emperor. The St Regis Hotel Rome will definitely make you feel like one, not just with it’s grand interiors but the very personable, warm service. Do you believe in “Eating little, and sleeping soundly” or do you like having your cake and eating it too? 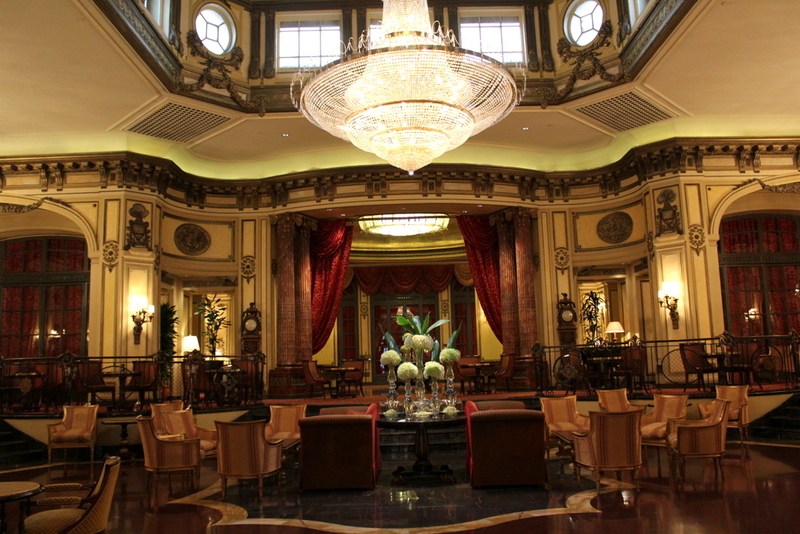 We were guests of St.Regis Hotel Rome, however this does not hold any bearing or influence in writing this blog. Oh I can only imagine how grand the St Regis is in Hawaii! 🙂 Same here, I couldn’t really think of anything to ask the butler to do, it still baffles me that some would have other people pack and unpack their bags for them! Oh what a treat for me this Wednesday morning as I sit here in my pjs and contemplate putting out the wahsing. I can’t tell you the thrill of popping over to visit a glam hotel in Rome with you. Funnily enough I am very very keen to get to Rome and even to take the kids, perhaps even next year. Of all the European cities, Rome is the one I long for… I have visited a couple of times when I was an au pair in Italy – aged 18/19 so a, cough, fair while ago. Look forward to reading more… I so love armchair travel and holiday dreaming. Seana I’m glad I can be of service via armchair travel for you this morning! 🙂 Oh I’m so sure your kids will enjoy Rome. 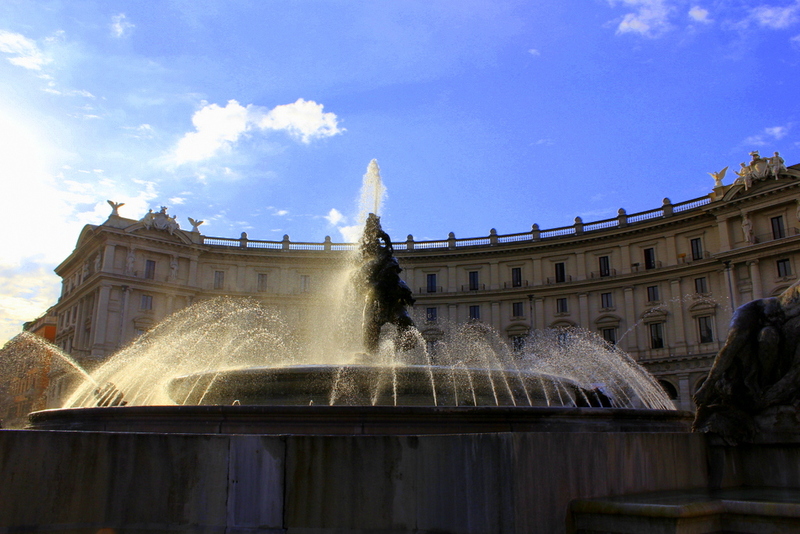 I loved Rome – the pace of life seemed just right , not too fast nor too slow and the weather is just very pleasant! Yes, the dashing butlers at your service! But this hotel seriously had excellent service from bell hops to butlers!